I met Wendy Marijnissen, 36, a photojournalist from Belgium and was quite intrigued by her story. An aspiring woman looking to capture the truth as it is, she came to Pakistan in Nov. 2009, throwing all caution to the wind that included turning her back on the travel advisory that warned western travelers. She believed in visiting with “an open mind” as the best entrance to a new country. Her mission—to capture through her lens the lives of Pakistani women. “I wanted to portray the Pakistani women, to give to the western audience a different view, which is less clichéd than what people might expect,” she told me. Given the security concerns in Pakistan, Wendy was brave. Moreover her target was to enter regional domains that are usually restricted to male photographers who find it easier to venture into the male dominated culture that identifies the inner regions in Pakistan. But Wendy`s commitment and story shows that a woman with a camera can portray an altogether different angle. Perhaps the best thing that happened to her on her first trip to Pakistan was meeting Dr Shershah Syed. His commitment to give women the best healthcare he could provide inspired her and convinced her that “maternal health” was a “story” that she could pursue. 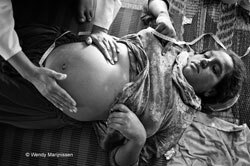 Wendy`s poignant photos of the displaced pregnant women in relief camps who had settled there after the 2010 June floods in Pakistan that submerged one fifth of the country following the torrential rains, and the meticulous text of the captions, captures every little detail. But then her approach to the subject is different too. She takes her time before clicking. “A snapshot feels quick. It’s like stealing a picture. But I’d like to feel the people I photograph gave me the picture. That is why I call myself a documentary photographer,” she told me. And so, on her third trip to the country, she spent a good ten weeks in camps for the displaced people. The first step was to get to know a few displaced families and the doctors working in camps. She told me, “the story became much more personal” and took a life of its own instead of being a mere statistic”. She recalled the night Hamida, an internally displaced person (IDP), delivered a baby boy at a private hospital in Karachi which was providing free reproductive healthcare to IDP women. Belonging to Shikarpur village, Hamida, and her family had been living in a relief camp for two months when Wendy met her. “I was tagging along with a midwife, visiting different tents talking to pregnant women. With Hamida I immediately felt a bond; it’s hard to explain the reason… maybe because she opened up to me easily,” she pondered. According to Wendy, the mother of four had had complicated deliveries and had suffered from bleeding in all her earlier deliveries. That made the photographs of Hamida`s safe delivery all the more important for Wendy. At the same time, through the images of these IDP women, she was also able to illustrate the warm hospitality that marks the culture of Pakistan. “I found the people extremely hospitable despite their difficult situation”. She was also taken in by the colourful traditional clothes worn by the women that had beautiful hand embroidery. “By taking photos, I was able to portray the resilience and perseverance of the people which is their culture,” she said “I couldn’t help but marvel at the dignity with which they held themselves,” she explained. Wendy said given the appalling conditions, people remained calm and smiling most of the time. According to the United Nations Population Fund (UNFPA), 320 women die for every 100,000 live births in Pakistan. The country’s Demographic and Health Survey (2006-07) meanwhile reports that Pakistan has about 30,000 pregnancy-related deaths each year. In addition, the UNFPA reported that of the 18 million displaced by the floods, 70 percent were women. Nearly 500,000 of these women were pregnant. That translated to some 1,700 going into labour each day, of which, UNFPA had warned, more than 250 would experience complications and be in need of emergency medical procedures. Wendy also observed live births during her time in the relief camps, an experience she says was “nothing short of a miracle”. Perhaps what impressed me most were her words when she said she felt “privileged” to be able to be part of birth process and there were moments when during delivery, she actually wanted to keep the camera aside as she found it “intrusion of a very private and significant moment in a woman’s life”. She was very careful to respect their Muslim culture and took great care that she didn’t photograph women in postures that appeared indecent or exposed them in ways that would embarrass them. And she said, the lesson she learned was that she realized that being a female photographer was an advantage in Pakistan as it enabled her to participate in the most intimate moments of a local woman`s life. Among the moments captured by her photographs, the most cherished ones are of mothers hugging and nestling their newborn for the very first time. But she has also seen the “baby being taken away and put in the hands of the mother-in-law first and later to the mother after she returns to her ward”. This is the experience of a foreign woman who tirelessly spent her time capturing the difficult maternal health conditions faced by poor and rural women in Pakistan. Wendy cames from a different culture where expectations of high health standards are a given. But when she left , she told us and the world another viewpoint—the resilience of Pakistani women who bravely give birth in places with callous conditions that represent what the richer west will never know.